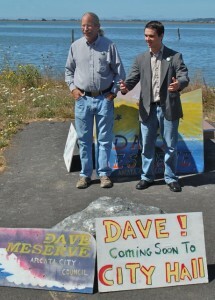 ARCATA MARSH – Arcata City Council candidate Dave Meserve officially announced his candidacy on Thursday afternoon in front of the floating boat dock at the Arcata Marsh, on South I St. Meserve chose to launch his campaign at the new floating dock since it was a project he championed while serving on the council and worked with others to create. “The Arcata Marsh highlights one of the many ways Arcata has been on the cutting edge of livable, prosperous, and progressive cities,” said Meserve. Meserve, who serve on the Arcata City Council from 2002 to 2006, spoke in front of over a dozen supporters, including business owners, former and current elected officials and other community members. This entry was posted on Thursday, September 9th, 2010 at 6:51 pm	and is filed under News. You can follow any responses to this entry through the RSS 2.0 feed.